Well, here’s a new one on me: An iPad app based on a concept from Microsoft, but developed by a pair of (non-Microsoft) Seattle programmers, with the help of Kickstarter funding. That, in a nutshell, is Zanther’s Taposé. The $3 app draws its inspiration from a Microsoft concept video that surfaced in 2009, which documented a proposed tablet device dubbed “Courier.” Sadly, Courier was doomed never to become anything more than a prototype, as Microsoft canceled the project in spring 2010. Taposé seizes upon Courier’s journal metaphor, letting you create multiple “notebooks” into which you can enter text and scribble freehand drawings, as well as drop images, video, recorded audio, clips from the Web or iOS’s Maps, and even “business cards” generated from your contacts’ information. 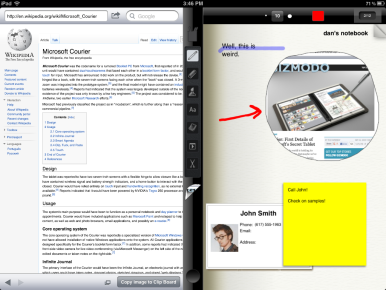 You can also highlight text, create lists (bulleted, ordered, or with checkboxes), and make sticky notes. The original video for the Courier project shows a foldable notebook-like device with two separate displays. Obviously, the iPad only has one screen. So, to compensate, Zanther has adapted Courier’s “spine” into a bar that can be dragged to create two separate panes. The bar also acts as a holding area for information you want to move from place to place. For example, you can drag-and-drop a contact or a Map location onto the bar, then drag it from there onto a page of your notebook. In some cases, you can also drag an item directly from one pane to the other. That dual-pane view is actually one of the most useful aspects of Taposé, since it allows you to do things like have a webpage open in one part of the screen while writing notes on another. I was looking for this very feature when I experimented with using my iPad for work; it’s functionality I take for granted on my Mac and miss when I use the iPad. As for the rest of Taposé’s capabilities, there’s a lot of promise, but calling the edges rough is like saying John Carter fell a little short of expectations. The app’s interface is glitchy and occasionally unpredictable. For example, there’s a cool feature that lets you draw your finger around a region of the screen to turn it into a clipping, and then drag that clipping from the holding bar onto a page of your notebook. But it turns out that anything you’ve drawn with the freehand tool doesn’t actually appear in the clipping. In its description on the App Store, the developers write, “If it seems like Taposé is trying to tackle and reinvent enough functions to fill a whole tablet, that may be because it is.” That’s a tall order for a single app and may be misguided: it’s hard enough to do one thing well, much less a slew of them. It’s clear that the Taposé developers went through the Courier video piece by piece and tried to remain faithful to the original vision—perhaps too much so. After all, Courier was a concept product that never shipped, and it was based on a combination of software and hardware. What works well on one piece of hardware doesn’t necessarily work as well on another. 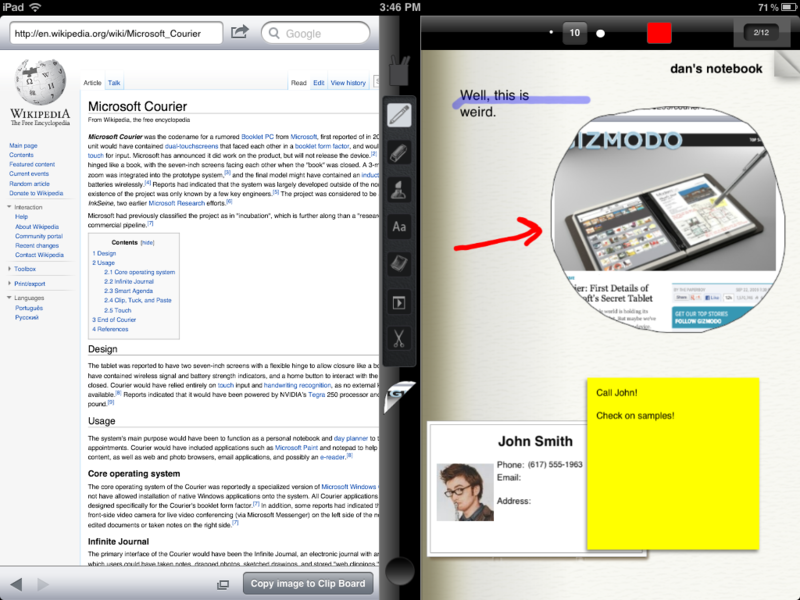 For example, Courier took handwriting recognition for granted; Taposé is missing that feature entirely. More to the point, the Courier video was just that—a video. Turning someone else’s concept video into an actual working app produces results that are, not surprisingly, hit-or-miss. As Steve Jobs famously said, “[Design] is not just what it looks like and feels like. Design is how it works.” Taposé’s developers don’t seem to have spent a lot of time thinking about exactly how the app should work. What I found perhaps most eyebrow-raising is that Taposé supposedly has the backing of J Allard, who headed up the Courier team at Microsoft’s Entertainment & Devices division. Allard’s title in that group was “chief experience officer,” but that “experience” is exactly where Taposé seems to have the most trouble. In the end, Taposé is hurt by trying to faithfully recreate something that never really existed—it’s like building a scale model of Atlantis.